Every year, UNESCO adds new sites to its World Heritage List due to their cultural and historic value to the world. Current UNESCO World Heritage Sites include sweeping wonders like The Great Wall and historical cities like Hoi An, Vietnam. UNESCO's goals include raising awareness about the preservation of places that are important to humanity and hold important historical and cultural significance. It's also pushes tourism towards these places, making the sites on UNESCO's list historical must see. This year UNESCO has added 26 new additions to its expansive list. The 18th century theatre in Germany, Bayreuth Opera House is one new addition. Many of these new wonders are ones that many have never heard of. The Bali Province's Subak System in Indonesia is a new addition to the list. It's five rice terraces and water temples that make up the irrigation system of canals dates back to the 19th century. Other wonders include the Rock Islands Southern Lagoon in Palau that has stunning natural topography and the remnants of stone working villages that were left in the 17th and 18th century because of climate change. 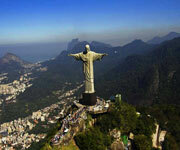 Rio de Janeiro, Brazil was chosen for the Carioca Landscapes that is topped with the famous statue of Christ atop Corcovado. The Western Ghats in India, which is a tropical mountain range that supports more than 325 species of animals and flora that are threatened in other areas of the world. Iran's Masjed-e Jāmé or Friday mosque is a stunning complex that was built in 841 and has continued to develop until present day. The 26 New Unesco World Heritage Sites. Is World Heritage Western Ghats in danger? Will Hiroshima become UNESCO World Heritage Site?